Cannon Fodder podcast: What happened to the Bucs' offense? Restaurant review: Bulla Gastrobar is solid, especially for brunch, but is there too much tapas competition in SoHo? Live coverage of Hurricane Irma, a major storm that devastated many Caribbean islands is now threatening Florida and Tampa Bay. This is coverage from the team at the Tampa Bay Times with latest updates on the storm. 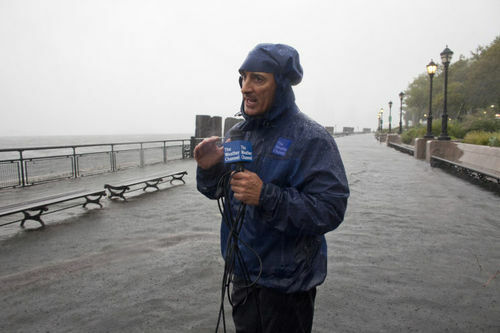 He's the man.Jim Cantore.Come hell or high water, whenever natural disaster strikes, the meteorologist is usually on the scene. All elementary and middle school child care programs at the St. Petersburg Parks and Recreation centers are canceled for this Thursday and Friday, Sept. 7 & 8, 2017. With all of Florida now under a state of emergency, our entire state faces an unprecedented threat from Hurricane Irma. In an effort to ensure the safety and well-being of all of our 50,000 students and 15,000 faculty and staff, the University of South Florida System will close beginning Thursday, Sept. 7 through Sunday, Sept. 10 to allow time for the entire USF family to prepare. All classes on those dates are cancelled. USF St. Petersburg and USF Sarasota-Manatee will also be closed and classes will be cancelled on Monday, Sept. 11. A decision about whether to open USF in Tampa on Monday will be made later this week. Tampa Bay TimesWASHINGTON - Florida Sens. 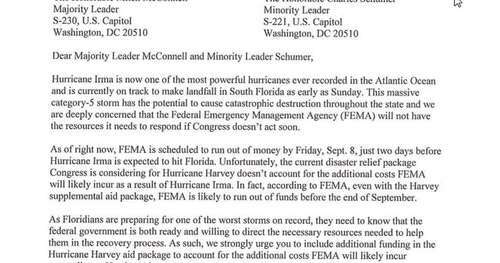 Bill Nelson and Marco Rubio have asked Senate leaders to add money for Hurricane Irma into the $7.85 billion package being considered for Hurricane Harvey. 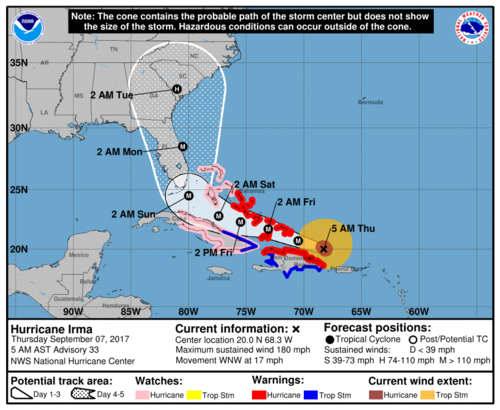 If Hurricane Irma makes landfall as a Category 5 storm, it would join a small group of historical storms: It would be only the fourth Category 5 storm to descend on the United States. 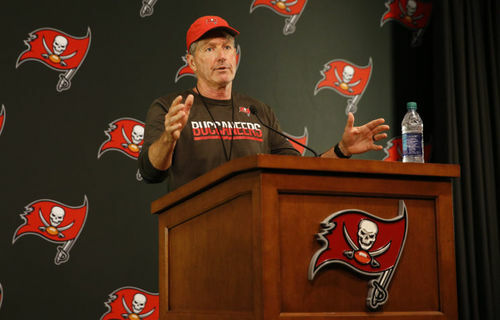 Tampa Bay TimesBucs coach Dirk Koetter says he is nervous about riding out his first hurricane in Tampa as Irma, an historic cyclone with its 175 mile per hour wind, zeroes in on the state of Florida and is expected to make landfall this weekend. All Pinellas County Tax Collector's Offices will be closed on Friday, September 8 to allow employees to prepare for Hurricane Irma. It is too early to determine whether offices will reopen on Monday, September 11. 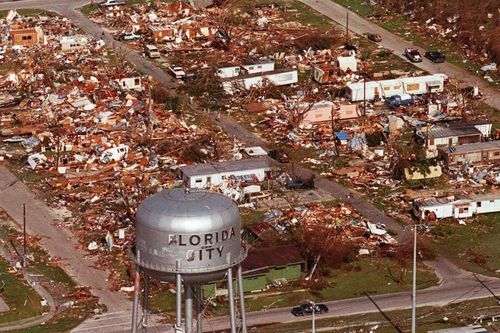 Tampa Bay TimesTALLAHASSEE — The board of Citizens Property Insurance Corp. unanimously approved two items that expand the state insurer's powers to respond to emergencies ahead of Hurricane Irma. The National Hurricane Center reports that the eye of Category 5 Hurricane Irma is moving away from the Virgin Islands. Tropical storm and hurricane conditions are spreading over Puerto Rico. Maximum sustained winds remain at 185 mph. Irma is moving toward the west-northwest near 16 mph. On the forecast track, Irma will pass just north of Puerto Rico on Wednesday night and then pass near or just north of the coast of the island of Hispaniola (Dominican Republic and Haiti) on Thursday. The extremely dangerous storm would be near the Turks and Caicos and southeastern Bahamas on Thursday night. 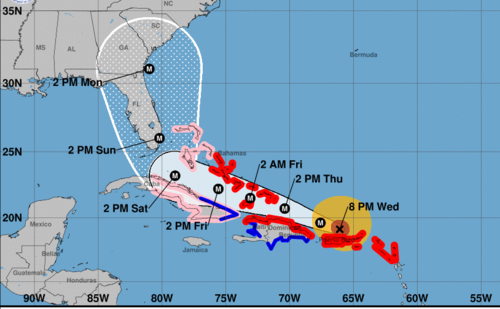 Forecasters say the threat of direct hurricane impacts in Florida over the weekend and early next week has increased. Hurricane watches could be issued for portions of the Florida Keys and the Florida peninsula on Thursday. Hurricane-force winds extend outward up to 50 miles from the center and tropical-storm-force winds extend outward up to 185 miles, the hurricane center says. In addition to Hurricane Irma, we now have Hurricane Jose and Hurricane Katia, the National Hurricane Center says. Katia has formed in the southwestern Gulf of Mexico near the state of Veracruz in Mexico. Jose remains far out in the Atlantic and is no posing a threat to land at this time. Jutting out into Hillsborough Bay, MacDill Air Force Base sits in a primary flood zone. 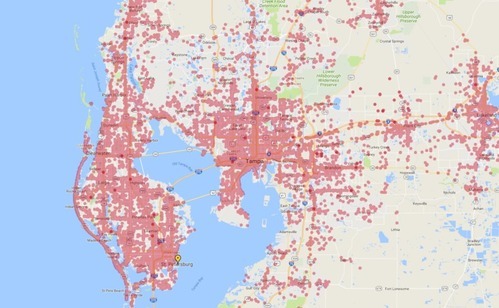 Tampa Bay restaurants are adopting a "better safe than sorry" strategy with the approach of Hurricane Irma. 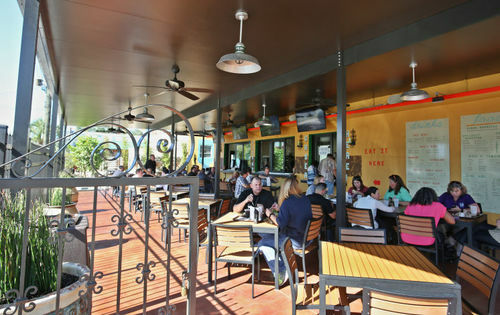 Peter Veytia, co-owner of Red Mesa, Red Mesa Cantina and Red Mesa Mercado, all in St. Petersburg, is closing as of tonight until further notice. Hurricane Irma, one of the most powerful hurricanes on record continued steaming toward Florida on Wednesday as its course continued to shift after three days. Tampa Bay TimesFederal officials with the U.S. Army Corps of Engineers said Wednesday that if projected rainfall estimates remain at between eight to 10 inches over Lake Okeechobee and Irma douses the lake as a category 3 hurricane, the vulnerable Herbert Hoover dike will be at “low risk” for flooding, and the lake is in “great shape” for the storm’s arrival. 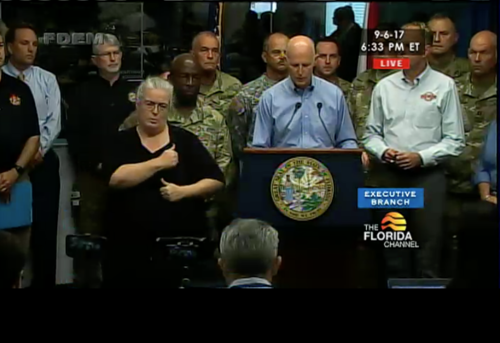 "This storm is powerful and deadline," Scott says. Every Floridian should take the storm seriously and take steps to protect their family, he said. 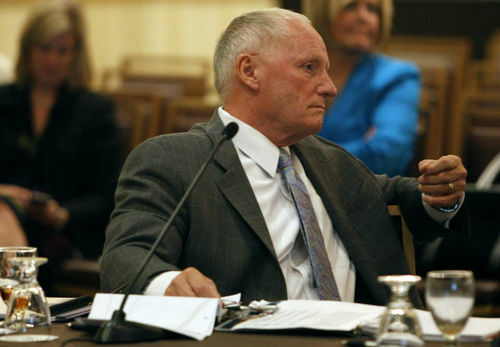 His staff is working to keep gasoline flowing to the state. A task force is also devoted to the Florida Keys, where hospitals are being evacuated. Help has been requested from the federal government. 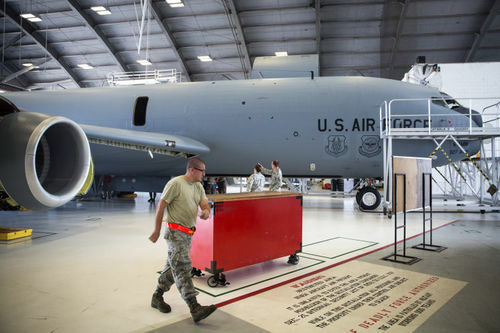 Florida National Guard troops that were sent to Texas are being recalled to Florida. Fuel availability is a top priority and Scott has asked other states to allow heavier fuel trucks to pass through on their way to Florida. "If you know you are going to shelter in your county, take only as much fuel as you need," Scott says. Take only what you need on fuel, water or food. At 9 p.m. Scott will speak with fuel retailers and hopes that gas is available at every station. School buses are being used in Monroe and Miami-Dade to help with evacuations. They are on standby for Broward County. All Florida Keys residents will be under a mandatory evacuation order tonight. Evacuate when you are ordered to do so, he said. All tolls have been waived on Florida highways. 1,000 Florida National Guard members are currently activated to help with Hurricane Irma. They are helping with evacuations now and will focus on search and rescue after the storm passes. We also have 30,000 troops ready to support the state. Florida utility providers are already prepositioning resources throughout Florida and in neighboring states. 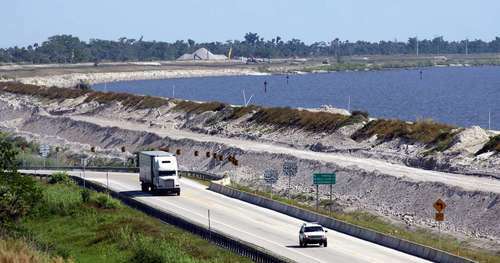 Lake Okeechobee water levels are still being lowered. We have no major concerns with the dike. Shelters: Evacuees from the Keys can shelter at Florida International University. Retailers are working to refill grocery shelves. More supplies are on the way, Scott said. We need volunteers, Scott said. We need about 17,000 volunteers statewide. Go to volunteerflorida.org to sign up to help or call 1 (800) FLHELP1. Every family needs to have a plan. Be ready today, prepare right now. Prescriptions can be refilled early at Florida pharmacies, the governor said. 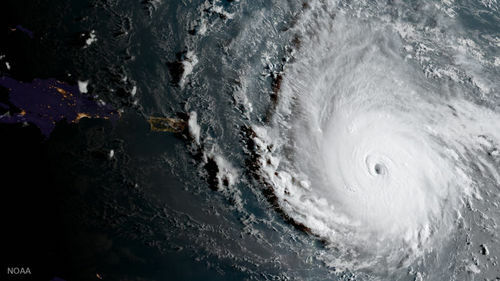 Cable and internet provider Comcast is offering free internet across Florida through Sept. 15 to help residents and emergency personnel stay connected during Hurricane Irma. 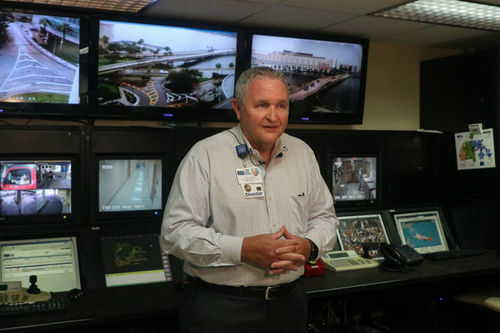 At Tampa General Hospital, Hurricane Irma is requiring preparations that haven't been needed since Hurricane Charley threatened the area 13 years ago. 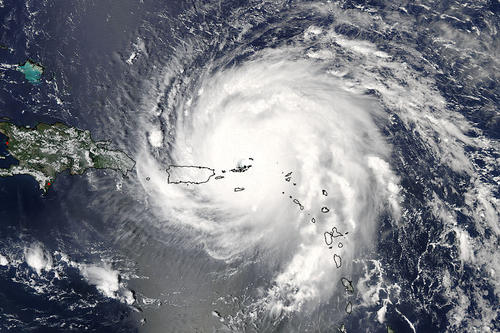 A hurricane with winds in excess of 180 mph is scary enough. But some corners of the Internet are stirring additional panic by referring to an extreme hurricane category that doesn't exist. Hurricane Irma is about 80 miles north of San Juan, Puerto Rico, the National Hurricane Center says. Irma continues to move toward the west-northwest at about 16 mph. After passing just north of Puerto Rico tonight, Irma will pass near or just north of the Dominican Republic and Haiti on Thursday. Maximum sustained winds remain at 185 mph. 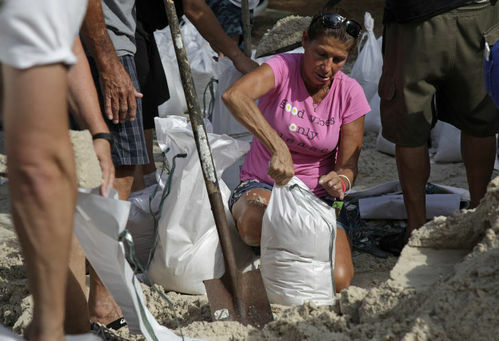 Hurricane Irma: Everyone lines up for sandbags, but do they help? 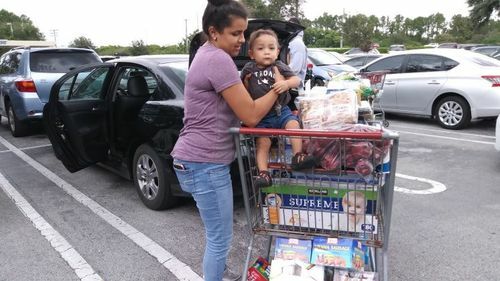 Tampa Bay emergency agencies have already distributed more than 200,000 sand bags this week that many folks spent more than two hours in line waiting to get. 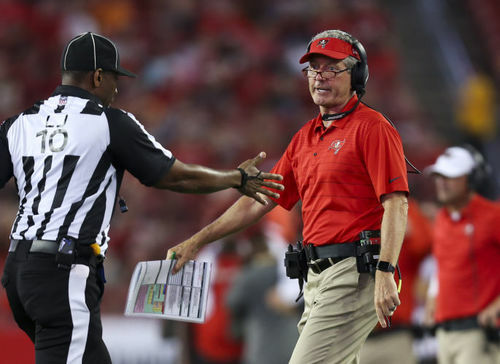 Bucs coach Dirk Koetter says he is nervous about riding out his first hurricane in Tampa as Irma, with winds up to 185 mph by Wednesday, zeroes in on Florida and is expected to make landfall this weekend. 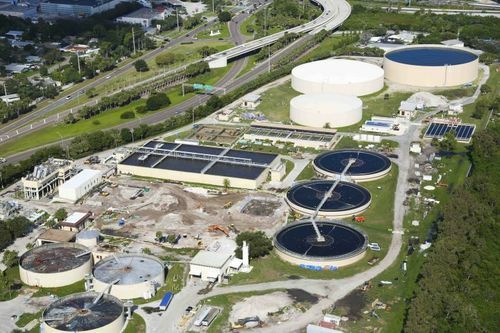 ST. PETERSBURG— The sewer system has been significantly upgraded since last year's massive discharges, city officials said Wednesday, but Hurricane Irma is such a powerful storm that it could potentially render the $60 million spent on capacity and pipes moot. Irma remained a Category 5 storm Wednesday with sustained wind speeds of at least 185 mph, one of the most powerful hurricanes ever recorded in the Atlantic Ocean. 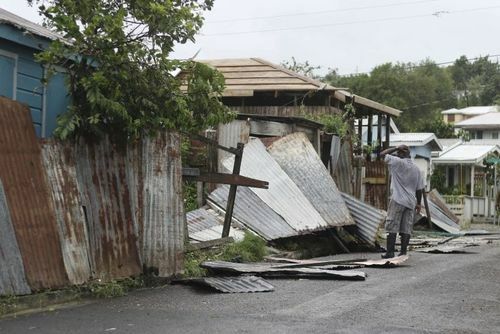 It passed over the island Barbuda in the eastern Caribbean Sea around 2 a.m. Wednesday, deadening communication lines there and ripping off the roof of the island's police station, sending officers for cover in the fire house. SAN JUAN, Puerto Rico — Hurricane Irma has killed at least eight people and injured 23 in French Caribbean island territories as the dangerous Category 5 storm roared over the Caribbean, France's interior minister said Thursday. Tune in regularly for live coverage of Tampa Bay events, breaking news and Florida court trials. Participate in live chats with Tampa Bay Times experts about local sports and other topics, like cooking in our weekly #CookClub chats.